Makeup Geek shadows won over the hearts of many beauty lovers when they first came onto the scene back in 2011, myself included. The thing I really like about MUG is that their shadows are affordable, high quality and come in a variety of colours, but do be warned they are incredibly addictive and you’ll be left wanting to fill your palette asap. Coming in single pans means that customising your own palette has never been easier, no depotting, no shadows that sit unused because you only bought a certain palette for a few of the shades. As well as a massive variety of colours, Makeup Geek also offer a range of different finishes from your standared shadows (mattes, shimmers, frosts, pearls) to foiled and even duochrome. As much as I love all the finishes, Foiled has to be my ultimate favourite with their intensely pigmented metallic finish that almost feels like a cream shadow. Whilst I currently only own 3 Foiled, I know it’s only a matter of time before I welcome more into my life. As my Makeup Geek collection has hit an almost obsessive level, I thought I’d put together a post sharing my favourite shades as it can be a bit hard choosing which colours to start with, especially as you’re ordering online which leaves you relying on others swatches and reviews. Luckily the blogging community is so massive that simply Googling a shades name gives you hundreds of reviews, swatches and even tutorials to give you a little inspo, the internet is a glorious place. As for storing them, I usually keep all my MUG shadows in my large Z Palette which holds 27 shadows but when I’m travelling and I know I only need certain shadows then I’ll swap them back into the small Z Palette (the one pictured above). Whilst Z palettes are my favourite palette to store the eyeshadows in, you can also use the MAC Pro Palettes or even the Make Up For Ever Palettes, both of which are cheaper. The extra large MUFE palette holds 45 shadows so if you’re a serious eyeshadow addict then that’s one for you – my life goal is to eventually fill one. Onto the shadows, the first row of colours are staples that I couldn’t be without. You can’t go wrong with your classic brown shadows, you can use them together for a matte eye (cocoa bear is incredible smoked out on the lid!) or use them in the crease and go in with some shimmer on the eye. Creme Brulee – Creme Brulee is one of my all time favourite transition colours. It’s a matte sand brown that makes the perfect in between shade allowing darker colours to blend seamlessly on top of it. As well as making the perfect transition colour, it also looks nice on the lid with purple toned shadows in the crease and a strong winged liner. Cocoa Bear – Let’s just pause for a second. Cocoa Bear honestly takes my breathe away and if you’re a warm toned lover like myself then I’m sure you’re with me there. Cocoa Bear is a warm matte brown that pairs perfectly with such a variety of looks. I love to wear Creme Brulee as a transition shade, Cocoa Bear in the crease and Grandstand on the lid – if there’s one MUG combo I’d recommend it would be those 3. Mocha – Mocha is a classic deep brown that you can’t go wrong with. If I’m wearing a super dark black shadow on my eye lid then I love smoke it out with this, it adds that hint of warmth without being too warm. It also works as your standard crease colour adding some darkness to a look without being black. Cosmopolitan – Cosmopolitan is such a beautiful shade, it’s a warm orange with a gold shimmer to it. If you have green eyes like myself then this really makes them pop. Whilst it’s just from the standard line of MUG eyeshadows, it almost feels more like a foiled shadow. I absolutely love this shade and I’ll have to get around to sharing a look using it soon! 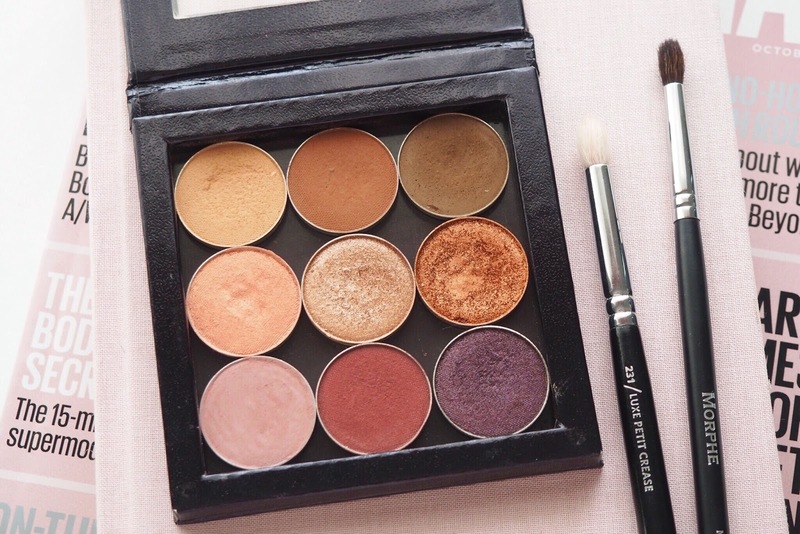 Grandstand – If I had to name my all time favourite Makeup Geek eyeshadow it would be this. Grandstand is a rose gold with copper undertones that’s just so beautiful on the eyelid. It was the first MUG shadow I tried and my love began the moment I swept this little beauty on my eyelids. Flame Thrower – Now Flame Thrower is one for those that like a super “boom look at my eyelids they’re on fire” type of look. It’s a bright orange copper that I absolutely adore. I love to pair this with Cocoa Bear and Mocha and it’s surprisingly more wearable than you may think. The formula is also a dream, it’s almost like a cream shadow so it’s super pigmented and it stays just as bright and pigmented throughout the day as it was when you first applied it. Unexpected – Unexpected is a matte mauve with a slight purple hue to it. I love to wear this as a transition colour when I’m going for a cooler purple eye and it works perfectly. It’s such a pretty colour that is very similar to MAC’s Haux (one of my all time favourites!) but a lot more affordable. Cherry Cola – Warm burgundy shadows are my thing, I own way too many but Cherry Cola is one of my absolute favourites. It’s matte so it’s perfect for the crease but it also looks nice blended out on the lid. It’s just such a beautiful shade. Burgundy lovers, this is one for you! Drama Queen – Drama Queen, I really love you. It’s hard to chose between burgundy or purple shadows being my all time favourites, but when I’m going for a purple look then you can guarantee this shadow was probably involved. Drama Queen is a frosted plum with a subtle shimmer to it, and whilst it does have that slight shimmer it still works well in the crease. So those are all my favourite Makeup Geek shadows, trust me it wasn’t easy to cut it down so expect a second part to this in the near future! I just love single shadows, as I’m writing this my Anastasia Beverly Hills order just arrived and I picked up 24 single shadows on black friday, hello 60% off, it would be rude not to have made the most of that, expect my ABH haul soon!